Dice Setting information for the craps enthusiast. It's More Fun When You Are Winning! Soft Touch Says - Hey, you weren't born in a barn! Where's your table manners? Last month, a reader wrote about a rude experience during a game of craps. Here's a new twist, the letter was not directed to the casino crew. The rude behavior was from other players in the game. The game of craps has a defined etiquette although it is usually left out of the craps books. By Andy's request, "Table Manners". Recently we got back from a trip to Las Vegas which I must say was a profitable trip. We did most our shooting at Bally’s and Paris. The dealers were great but table manners from players and those getting into game left the (good players) shaking their heads. In the middle of good rolls we had the shooter, on more than one occasion, on his cell phone, talking to buddies, and flirting with the waitress. On the other side, again during a good roll, guys were throwing money in for chips only and delaying the game. In fairness the boxman tried to instruct them on what to do. However, it seemed that the other players thought it was up to them to know how to play and act. If you or Soft Touch could address table manners in a future news letter I believe many dice people would appreciate the topic. You bet Andy. Here you go, your request and with permission to reprint, “Table Manners” from the Professor. · Be patient, be alert, and be ready to make your wager when it is your turn to bet. · Be polite! Learn the dealer’s name and use it when booking your wager. It helps to get their attention, as well as a way of honoring them. Respect commands respect. · Wait your turn to be paid and before giving the dealer new betting instructions. If you have a winning place bet, wait for the dealer to come to your bet before giving instructions like; "same bet, press up, take down". · Make your wagers when the dice are in the middle of the table, in front of the box man. There is plenty of time and all you have to do is be ready when it is your turn to bet. You will not be left out. It’s their business to collect every willing bet. · Don’t try to make late bets after the dice are out. It slows the game. · Don’t toss your money or chips out in front of the shooter after he has the dice. It “crosses the energy”. If you must make a late bet, get the dealers attention by name and make a call bet with the chips in you hand. After the roll, politely put your action down in the Come Field for the dealer. · Keep your hands up and out of the table at all times, except when making a bet at the appropriate time. · Too often a zealous player, pointing out their bets to a friend, “crosses” the shooter’s throwing lane. This blocks their line of sight, or worse, the dice hit the hand. This may sound as a hooky superstition, but it usually results as a seven out. The pointing crosses the energy of the shooting zone. · Keep your movements to a minimum when the shooter has the dice. · Limit your conversation. Focus on the game. If you want to talk about last night’s ballgame, take it to the lounge. · Camaraderie, “high five and way to go shooter" is fun and usually okay. However, many shooters are "head down, blinkers on" kind of players and all the yahoo stuff is a big distraction from their game. Be conscious of what kind of celebrating is appropriate. We want the shooter in the “zone”. · Never ever get into an argument with other players or the crew. If a referee is required, then that becomes the boxman’s job. You keep your lip buttoned down. Mind your own business. · You may politely point out a mistake, but it is important to remember that craps is the casinos’ game and played by their rules. Your emotional control is crucial. Emotional out bursts kill a game quicker then anything I know. It is pointless to argue your interpretation of the rules with the crew or boxman. · Be aware and conscious of your involvement in the game making sure that you are contributing to the flow of the game and not holding it up. This means not making oddball bets in weird amounts or causing the dealer unnecessary work, for example. · Losing is part of the game. Be a gracious loser when you leave the game. It is an expression of who you are and a courtesy of respect to those remaining in the game. 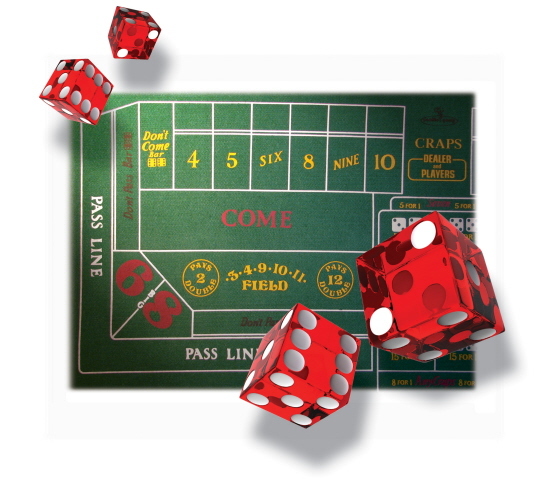 · Just because it is called a craps game does not mean you get to talk crap. Profanity really is not acceptable language in the game. Last Call only a few seats available. Take your game to the next level in Las Vegas! If you are not Playing 4 Keeps, perhaps you should. Orders usually shipped same day. Contact us if you have any comments or ideas for future issues. Dice Setter.com Newsletter™ is published by DiceSetter.com. It is intended to be informational and entertaining. Do not consider the information a guarantee for supplementing or replacing income. Casino games are adult entertainment, games to be played and enjoyed. It is the intention of the publisher to provide information so the reader may play with more enjoyment. Opinions expressed by the contributing authors are not necessarily shared or endorsed by the publisher. Winning is a goal and not a guarantee. Please Email ed@dicesetter.com for more information.